These vines at Destiny Ridge Vineyard in the Horse Heaven Hills escaped damage from the November 2010 freeze, though vines just across the road were hurt. If history is any indication, there will unlikely be a winter freeze anytime soon in Washington wine country. Washington’s Columbia Valley offers superb growing conditions for European wine grapes: warm days that are filled with sunshine, almost no rainfall from May to October and sandy soils that cause the vines to struggle to survive. In fact, one of the few issues in Washington wine country is the occasional “winter event” that occurs every five to eight years. On occasion, they will happen on back-to-back years. Such events can cause widespread and devastating damage to vineyards throughout the Columbia Valley. Typically, the damage lasts one season – or the amount of time it takes for the vine to grow. This is why most Washington state vines are own-rooted (vs. California, Oregon and European vines, which are grafted onto root systems native to the United States). If Washington vines were grafted, many vineyards would need to be replanted every five to eight years, effectively ending the state wine industry. Instead, a vine might be damaged to the ground but can be retrained from its root system. European vines are grafted onto U.S. grape roots to combat phylloxera, a root louse that devastated vines in Europe, California and Oregon during much of the last 150 years. An interesting fact about Washington’s “winter events” (as they’re euphemistically called) is their regularity. Going back more than a half-century, we can track them – without fail – every five to eight years. 1949-1950: Two years of destructive winters devastated Washington’s young wine industry. In 1949, temperatures dropped to minus 8, and another deep freeze in 1950 discouraged grape growers from planting more vineyards for a few years. 1955: Temperatures plummeted from the 60s on Dec. 10 to below zero just five days later, causing serious damage to vineyards. Two years later, temperatures dropped nearly 60 degrees in mid-January to minus 18 for three straight days. 1964: On Dec. 4, temperatures peaked at an unseasonal 60 degrees in the Columbia Valley, then plummeted to minus 7 by Dec. 16. 1968. On Dec. 28, temperatures were a modest 43 degrees, then dropped to minus 11 just two days later. 1972: Grape growers got a double dip in winter events. In January, temperatures went from nearly 60 degrees to minus 1. That November, they dropped from the 50s to minus 7 in days. 1978-1979: On Christmas Day, temperatures were a balmy 55 degrees. But less than a week later, they dropped to minus 4. 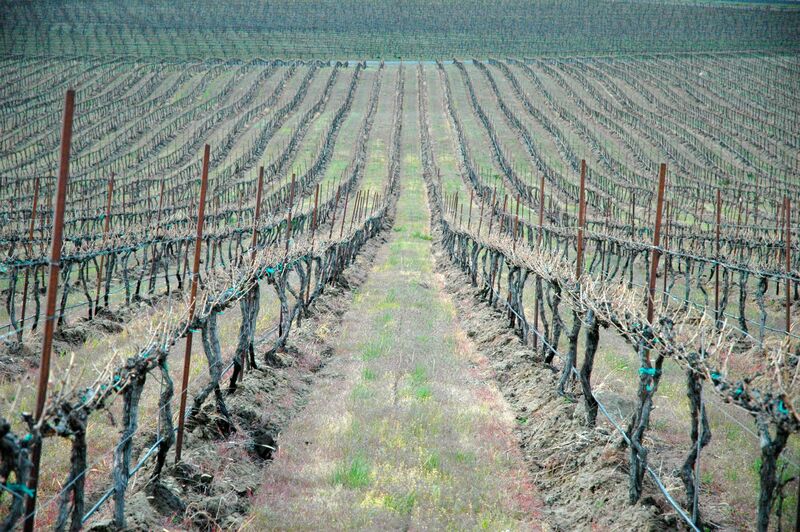 A deep freeze continued into February, causing catastrophic damage to vineyards throughout the Columbia Valley. Cold Creek Vineyard, owned by Ste. Michelle, had been planted just a few years before and looked war-torn after this freeze. Ultimately, it was replanted. 1983-1984: On Dec. 14, temperatures reached a high of 45 degrees then plummeted to minus 14 in 10 days. The next year, temperatures dropped nearly 70 degrees in a few days, causing damage to young vineyards. 1989: On Jan. 31, temperatures reached a high of 65, then dropped two days later to minus 1 in just two days. Fortunately, damage was not widespread. 1990-1991: On Dec. 17, the mercury rose to into the 50s, then feel to minus 3, then went up to 50 and fell again to minus 8, causing plenty of vineyard damage. 1996: Mid-January temperatures rose to the mid-50s, then dropped as low as minus 18, causing widespread damage except in the Horse Heaven Hills. One issue was that plenty of snow fell, then the skies cleared. Thus, the sun would come out during the day, reflecting off the snow and warming the vines. Then when the sun went down, the vines would freeze again. This caused damage to more than 40 percent of Washington’s vines. However, because Syrah plantings managed to make it through this winter event (thanks to being planted primarily on hillsides and at higher elevations), Washington growers became less fearful of planting the tender variety and the Washington Syrah industry took off. 2004: January temperatures dropped from 18 degrees to minus 17 in just two hours. The Walla Walla Valley sustained the worst of the damage, losing about 80 percent of its grapes for that vintage. There was damage elsewhere in the Columbia Valley, but it was somewhat minimal. 2010: A sudden and early freeze occurred overnight on Nov. 23, falling to minus 6 in the Horse Heaven Hills, which had been somewhat immune to damage in past freezes. One grower said it was the worst he had seen in 30 years. Famed Champoux Vineyards ended up pulling out replanting its “Circle Block,” which grew grapes that played a significant role in Quilceda Creek Vintners‘ Cabernet Sauvignons that had earned perfect 100-point scores from The Wine Advocate. Damage also occurred in the Yakima Valley, Walla Walla Valley and Columbia Basin, though the Wahluke Slope went relatively unscathed.